Beauty Garden Organic Body Scrub gently exfoliates skin with an original 100% natural vegan formula of beetroot sugar and calendula ! This scrub for body is used on dry skin. When you rinse it with water, sugar grains melt on the skin and gel texture turns into milk, leaving your skin silky soft. 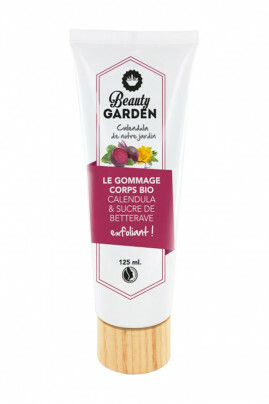 Treat yourself with a pure pleasure of senses using Beauty Garden Vegan Body Scrub ! Watch this orginal Body Scrub turn into milk ! On dry skin, apply Beauty Garden Natural Body Scrub and massage using circular motions. Then rinse with water to make it turn to milk, leaving your skin smooth and glowy. Helianthus annuus (Sunflower) seed oil*, Sucrose, Glycerin, Prunus amygdalus dulcis (Sweet almond) oil*, Sucrose laurate, Citrus aurantium dulcis (Orange) fruit water*, Calendula officinalis flower*, Parfum (Fragrance), Tocopherol, Linalool.